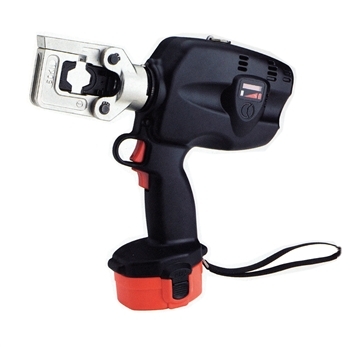 Electric crimping tool for installing the INOX railing system. Used to crimp terminals onto wire rope. Features portable oil-dynamic battery power with pivotable head for pressing wire ropes. -Basic tool with battery, wrist strap, and shoulder strap.